Descendants of Revolutionary War Veteran, Alexis Lemmon at his graveside at Shauck Cemetery with Pastor Patrick Kelly. From left are Kathleen Wood Luchsinger, Marcia Coe Wood, Pastor Patrick Kelly, Carol Coe Hartpence and Kelly Hartpence Beck. JOHNSVILLE — Carol Coe Hartpence and Marcia Coe Wood appreciated the ceremony honoring their ancestor, Alexis Lemmon, at a graveside service in Shauck Cemetery last Sunday. Lemmon’s daughter Rebecca is in the direct line of ancestors for the two Coe sisters. Lemmon, a Revolutionary War Veteran, moved to Ohio from Maryland late in life to live near four of his eight daughters. Carol listed the ancestors on their family tree going back to Alexis’ daughter, Rebecca Lemmon who married John Shauck III. Their son Elah Shauck married Barbara Halderman and their daughter Rebecca married Albin Coe Jr., who is Carol’s great-great grandfather. Carol recalled that Albin’s farm was just up the road from the Shauck Cemetery on the right. “It was very thoughtful of Pastor Kelly to have this ceremony for Alexis Lemmon,” said Hartpence. Pastor Patrick Kelly of St. John’s Lutheran Church in North Woodbury honored Lemmon in a brief service at the graveside. Pastor Kelly is a member of Sons of the American Revolution. He is a direct descendent of Reuben Frisbie of Connecticut. Kelly said that Reuben Frisbie wrote a daily diary during his time in the Revolution. It has been given to a museum for safe-keeping. Pastor Kelly became interested in the life story of Alexis Lemmon last year when he participated in the Shauck Cemetery walk. He noticed that there was no marker or insignia to note that Lemmon was Revolutionary War veteran. 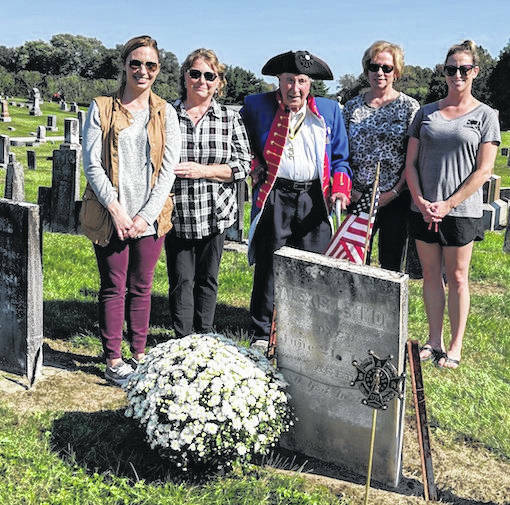 He was gratified to sponsor the ceremony and present the new grave marker that signifies Lemmon as a Revolutionary War veteran. Morrow County Historical Society member Dan Rhodebeck read from the 1984 Morrow County Sentinel article that gave some history of Lemmon and his family. The Sentinel article noted that Captain Alexis Lemmon was prominent in Johnsville history. “Born February 23, 1746 in Ireland, Alexis Lemmon came with his father John Lemmon to Baltimore. He and his six brothers became known as great patriots in the struggle against the Mother Country. On January 4, 1777, Alexis was commissioned as a Captain in Washington’s Army. He had married Rachael Stansberry, sister of General Stansberry. The Lemmon family prospered, he became a member of the Maryland Legislature and acquired a large plantation. His estate was known as the “Eight Sisters Plantation,” undoubtedly because during the war years, between 1772 and 1786, eight daughters were born to them.